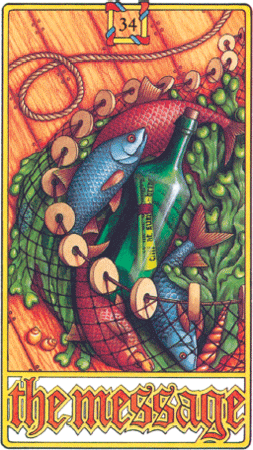 The Message Card is alerting us to be prepared for incoming signals from our inner depths. They can manifest themselves in dreams, in fantasies, in art and music, in curious coincidences or in our own body language. Jesus told his messages in parables. The truths in symbols, ritual, dreams, art creations, plays and stories have more chance of getting through our defences if they come in disguise or dressed up. Some of the most important messages we receive have to be in a sort of code. The Message Card encourages us, therefore, to start decoding the world around us and in ourselves.